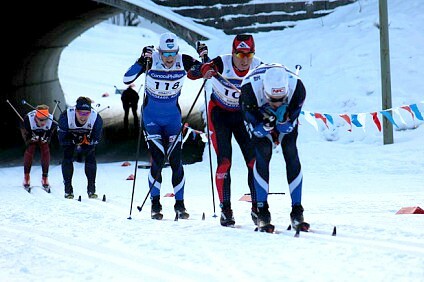 Right to left: APU’s Tyler Kornfield, SSCV’s Noah Hoffman, APU’s Eric Packer, SSCV Kris Freeman, and DU’s Eivind Romberg Kvaale heading out of the stadium tunnel and toward the finish for the men’s 30-kilometer classic mass start at the 2018 U.S. Cross Country Championships in Anchorage, Alaska. Kornfield won the race, Packer placed second. As the title suggest, we are giving away the keys: Eric Packer, long of the Alaska Pacific University Elite Team, will be posting to our instagram account this week. If you know Packer, his own IG account can be found here, @eric_packer, you understand he has a fondness for the camera lens. He’s a rocket fast skier. But he balances his athletic pursuits by working as an engineer and getting behind the lens. His still photography and videography have captured our attention for years. Packer was an obvious choice when it came to sending out a request to take over the @fasterskier Instagram account. Check out the video below. It’s clear, Packer can work both the lens and the editing. If that video does not make you fall in love with the potential of being fit and cruising on skinny skis — then we may not be able to help you. On to Instagram with our first #fasterskiertakeover.